Mr. Baggett has been unable to get a full handwritten note from Senator John McCain to properly compare the candidate’s leadership qualities. “I don’t think comparing just signatures is really enough writing to be accurate, truly insightful, and comprehensive. When approached with the proven system we teach, graphology is a scientific based personality tool that can be incredibly useful in business, politics, and even relationships. Why minimize it by analyzing just a signature?” So, Baggett is still waiting for someone to come forward with a full page of handwriting from Mr. McCain. 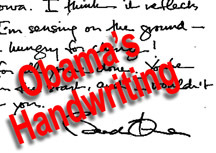 So, is Obama’s handwriting really a glowing example of leadership and charisma? The book also goes on to state the absence of any single handwriting stroke does not mean the person does not necessarily have elements of that character trait … esteem can come in many places in the writing. Mr. Obama has confidence and a healthy ego… as shown in his large beginning letters of his autograph. So, we aren’t sure of his esteem from his letter t, alone. Bart Baggett is one of the world’s top court qualified handwriting experts. He is president of Handwriting University, which has students in over 17 countries and campuses in the USA, India, and Taiwan. He is a frequent guest on such TV networks as Court TV, CNN, and Fox News. He has even successfully survived appearances on the Howard Stern Show and VH1’s ” I Love New York”.